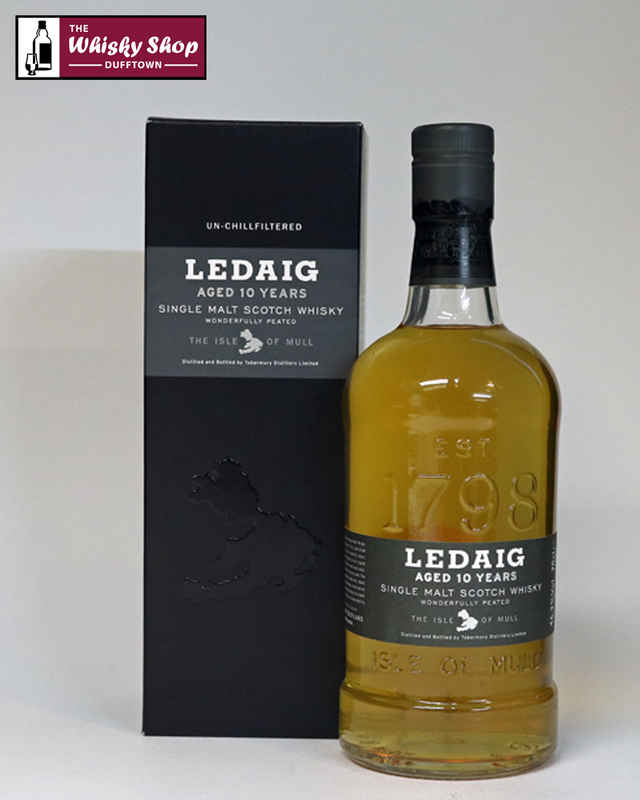 What gives Ledaig 10 Years Old Single Malt Scotch Whisky its intensely complex character? First, peat-dried malted barley is married with aromatic water, drawn from dark mountain lochs . What gives Ledaig 10 Years Old Single Malt Scotch Whisky its intensely complex character? First, peat-dried malted barley is married with aromatic water, drawn from dark mountain lochs . Matured in superior oak wood casks, the spirit then lies undisturbed for ten long years. Distillery: Sweet briny smokiness with a distinctly island character that hints at mild antiseptic, creosote, wax polish, mint chocolate and floral seaside aromas. Distillery: Tantalisingly sweet yet medicinal flavours release sparks of spicy pepper with peaty smoke and vanilla malty creaminess. Distillery: Spicy white pepper and sweet vibrant liquorice and cloves with a lingering saltiness Un-chill filtered @ 46.3%.